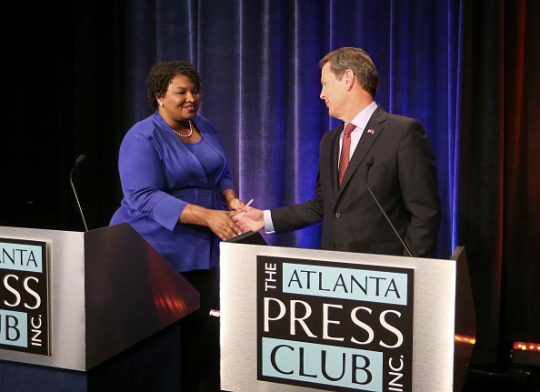 Abrams lost to Republican Brian Kemp in one of the closest governor's races in decades in November, and she derided the election as not being "free and fair," accused Kemp of systematic voter suppression as secretary of state, and refused to recognize his win as legitimate. She harkened back to the controversial NFC Championship game to further protest her loss on Monday to a crowd in Albany, Georgia. "If you saw yesterday’s playoff game between the [Los Angeles] Rams and the [New Orleans] Saints, there was a call that should have been made and folks are righteously indignant," she said in remarks flagged by The Daily Caller. "There was a call that should have been made a long time ago in Georgia—you don’t get to be the referee and the player." Abrams' defense of the Saints could raise eyebrows in Georgia. The Atlanta Falcons are Georgia's NFL team and the Saints' most hated rival, although it's worth nothing many former New Orleans residents relocated to Georgia in the aftermath of Hurricane Katrina. "I am running for office again," she said. "I don’t know for what." If she were to run for the Democratic Senate nomination, she would almost surely clear the field of any challengers, given her strong state infrastructure left over from her gubernatorial campaign. Abrams founded a voting rights group called Fair Fight Action to improve elections and increase turnout in Georgia. Her 2018 campaign manager, Lauren Groh-Wargo, is the group's executive director and promised to keep holding Kemp's feet to the fire. "We are going to give Brian Kemp living hell," she said. "Because I got news: Georgians want to know their votes count." This entry was posted in Politics and tagged Brian Kemp, Georgia, Stacey Abrams. Bookmark the permalink.